recognize author Galgani from his radio show & ties to Investors Business Daily. Books are usually a good investment, those like this one are more so. So invest in your future today! "To be a successful investor, start with the basics and stick to the rules. Matt's book shows you how to do that. It may be the missing link you've been looking for." "Getting Started takes the guesswork out of investing. Anyone can use these routines and checklists to become a successful investor." Through both bull and bear markets, Investor's Business Daily's CAN SLIM(R) Investment System has consistently been the #1 growth strategy, according to the American Association of Individual Investors. 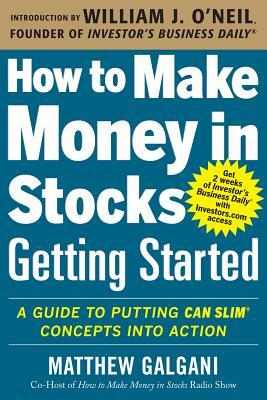 How to Make Money in Stocks--Getting Started shows you how to put the CAN SLIM System to work for you. So whether you're new to the stock market and a little nervous about jumping in--or if you've been investing for awhile, but aren't yet achieving the kind of results you want--How to Make Money in Stocks--Getting Started gives you a clear, step-by-step path to investing success. Matthew Galgani is co-host of IBD's How to Make Money in Stocks radio show, editor of the IBDextra Newsletter, and IBD TV(R) market commentator. With Bill O'Neil, he developed the IBD Meetup Investor Education series used by investing clubs across the country.